AmericanMuscle has a bunch of new parts and exciting Mustangs coming your way in the month of January. Watch us tighten up the suspension on our 2006 GT–Project Grabber Boost–and introduce a twin turbo kit for 2011-2014 GT & BOSS Mustangs that can boost your Coyote up to 1200RWHP. Project Grabber Boost gets the Stage two treatment–a full suspension rebuild formulated to deliver much lower 60ft. launch times. Speaking of boost, Mustang Mayhem is right around the corner and this time we’re facing off a lineup of built Coyote GTs against some more mildly modded 2007+ GT500s. It’s going to be a must-see for GT owners that want to know what it takes to run down the top-dog GT500, as well as the GT500 guys/gals curious to see the gobs of power that can be made with a few simple mods. Get your bets in for what type of build you think is going to win this year. Edelbrock’s E-force superchargers for 2005+ Mustangs pump out some serious power and are a great way to bump that GT up to GT500 power levels. However, if you’re a power junkie and absolutely need to run down every car you line up against, the Armageddon twin turbo kit for 2011+ GT/BOSS Mustangs will provide your Mustang with the kind of dominance you’d expect from Muhammad Ali in his prime. 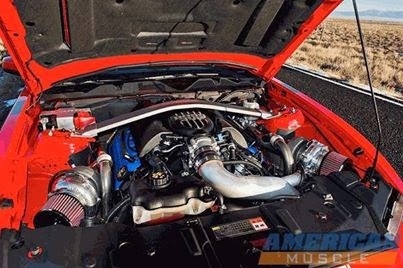 Depending on whether you go with Garrett’s 76 or 82mm turbos, you can dial down the boost and keep it streetable at 600RWHP, or crank up the boost and dial in at ~1,200RWHP. With this complete kit, the choice is in your hands. As far as the less extreme, more casual mods go, Modern Billet dropped a ton of 1994-2014 Mustang interior styling parts, including Ford official parts sporting the Mustang’s running pony logo. We’ve now seen under the hood of both the 2015 GT and EcoBoost 4 cylinder Mustangs, albeit a bit rough while still in “prototype” form. Look for Ford to spruce things up by the time production model cars start rolling off Detroit assembly lines. From the 12th through the 18th of this month you can save a bunch of cash by shopping our Presidents Day Sale. Still short on dough for that next mod? Enter our sweepstakes for February and you could be the one who wins the $400 AmericanMuscle.com.